Custom exhaust flange for Chevrolet 2.0, 2.2, 2.4 liter Ecotec engines. 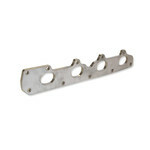 This flange is 3/8" thick laser cut stainless steel and is perfect for custom exhaust or turbo set up. The ports are slightly over-sized to allow for better airflow.